As some of you may be aware, I often recommend soy as part of a whole foods diet. Many people question why I include these foods in light of such startling media coverage on the dangers of soy. The reason is relatively simple. I have reviewed reams of research and many claims for and against soy foods. From the studies available, I can tell you that soy is neither as good as the proponents say, nor as evil as the critics claim. I wish we had more convincing science to report, but we don’t. The key is to take all the available evidence together and see what shakes out. In today’s blog I have done that for you. I will review some of the recent data for and against soy, and provide you with a few guidelines and things to remember when choosing soy foods. So what’s a confused consumer to do? Give up on soy until we know for sure? Or chow down on soy nuts? Don’t panic. There are some things we do know about soy, both good and bad. 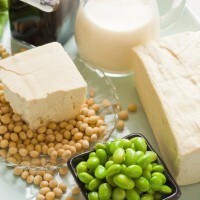 First, you should be aware that the amount of soy used in many of these studies was much higher than what we normally consume — the average dose of soy was equivalent to one pound of tofu or three soy protein shakes a day. That’s a lot of soy! Most people just don’t eat like that. So when you read negative things about soy, remember that many of those claims are based on poorly designed studies that don’t apply to real-world consumption. You could apply that thinking to other studies, too — like those that show that broccoli contains natural pesticides or that celery is high in toxins. Sure, those foods might cause you some problems — but not in the amounts that most of us eat. The same is true for soy. Second, it’s important to recognize that many of the common claims about soy simply don’t pan out when you look at the evidence carefully. Let’s review four of these claims and the science behind them so you can have a better understanding of the real relationships between soy consumption and potential health threats. All population studies (studies of groups of people) of soy either show reduced breast cancer risk or no effect. The only studies to show increased cancer risk are on mice with no ovaries or damaged immune systems who eat high amounts of processed soy. Studies in mice WITH ovaries and functioning immune systems show inhibition of tumor growth. Mice studies may not reflect the effect of soy on humans (in case you didn’t notice, mice and humans are not the same species). High breast tissue density is linked to a higher risk of breast cancer. Breast tissue density increases with estrogen replacement, but decreases with isoflavone consumption in postmenopausal women. That’s a good thing. Eating soy foods at an early age (childhood and the teen years) appears to have a significant protective effect against breast cancer. If you really want to reduce your risk of breast cancer, drink less alcohol and eat less trans and saturated fats — all of these compounds may raise risk in high amounts. If it’s a choice between chicken nuggets and tofu, I recommend tofu! Some 20 million infants have used soy formula since the 1960s — but some people are concerned that the isoflavones it contains could affect a child’s growth and reproductive development. Yet the only large, long-term study on humans, published in the Journal of the American Medical Association, (ii) found that there were no major health differences in 811 men and women between the ages of 20 and 34 who had been fed either soy or milk formula as infants. More recently, a report issued by the National Toxicology Program Center for the Evaluation of Risks to Human Reproduction concluded that there just isn’t enough human or animal data to say for sure whether soy formula harms a baby’s developmental or reproductive health. So what should a mother do? First, breastfeed if at all possible, for as long as possible — ideally until your child is one year old. If that’s not possible and you have to use soy- or dairy-based formula, don’t beat yourself up about it. If there are any risks, they are likely to be very small. Hopefully, continuing research will shed more light on this question. I think this claim makes a mountain out of a molehill. Yes, there’s no doubt that soy can affect your thyroid gland — the real question is, how much does it take? If you’ve read that soy is bad for your thyroid, you’re probably reading claims based on a few poorly-designed studies that have been blown out of proportion. Instead, consider this: A review of the research found no significant effects of soy on the thyroid except in people who are iodine deficient — a condition that is rare in this country. Another well-designed study in the American Journal of Clinical Nutrition (iii) studied the effect of realistic amounts of soy protein on hormones, including thyroid hormone. It found that soy had no significant effects on these hormones. Based on my assessment of this and other research, I am convinced that normal amounts of traditional soy foods pose no risk to thyroid function. Now here’s a claim that DOES have some basis in fact. That’s because soybeans — along with other beans, nuts, and seeds — contain compounds called phytates, which bind to minerals inside your body and contain some potentially harmful compounds. The Asian cultures that have traditionally consumed soy typically ferment it first. This process breaks soy down and makes it easier to digest. Plus, fermentation adds extra nutrients and probiotics (“good” bacteria) to soy. For these reasons, I prefer fermented soy foods, like miso, natto, tempeh, tofu and some brands of soy milk. In truth, good human studies on soy are limited, but those we do have suggest that soy may help lower cholesterol, prevent cancer, increase bone density, protect the kidneys of people with diabetes, and relieve menopausal symptoms like hot flashes. The dangers of soy are overstated (and the benefits may be, too). We eat far too much processed soy (and processed foods in general). Stay away from those in your diet including soy protein concentrates or isolates, hydrolyzed or textured vegetable protein, hydrogenated soy bean oil, non-organic sources of soy, and soy junk food like soy cheese and ice cream. Don’t eat them. Whole soy foods can be a source of good quality protein and plant compounds that help promote health. Eat only organic soy. Stay away from genetically modified versions. Replace soy oil with olive oil, fish oil, nuts, and seeds. Breastfeed your child. I prefer that no one feed dairy or soy formula to their babies, but if you have to, try not to worry about it. Don’t worry about soy’s effect on breast cancer if you eat it in the forms and amounts I recommend. It has even been shown to protect against breast cancer if you start eating it at a young age. The effects on the thyroid are not significant or relevant unless you are deficient in iodine (which you can easily get from eating fish, seaweed or sea vegetables, or iodized salt). I’m eager to see more research on the effects of soy on our health. But as we wait for more studies, there’s no need to pass up this healthful and delicious food. It can be safely included as part of a whole foods diet — which is one of the most important keys to lifelong vibrant health. This topic was modified 3 years, 2 months ago by pam pam.